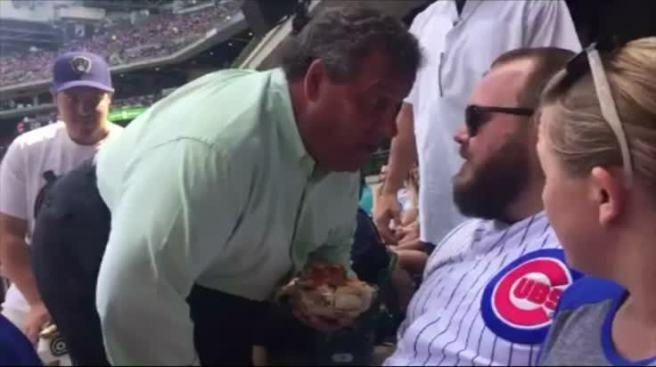 New Jersey Governor Chris Christie was seen on video in Milwaukee this weekend in what appeared to be an argument with a Cubs fan. The footage, which was posted to social media Sunday, shows Christie bending down to get in the seated fan's face. He can be heard saying "you're a big shot" to the fan before walking away. The man seen in the video, identified as Brad Joseph, told a local reporter the confrontation started when he yelled Christie's name and told him he "sucked." Joseph said he called Christie a "hypocrite" before the governor turned around and began yelling at him, allegedly saying "Why don't you have another beer?" and calling him a "tough guy." Christie's office could not immediately be reached for comment. Christie, whose son works for the Brewers, hasn't had the best response to his attendance at baseball games this year. Two weeks ago, Christie was loudly booed at a Mets game after catching a foul ball and giving it to a child behind him. Christie, a big Mets fan, was sitting in the third row, near the New York dugout, when he caught the ball lifted by Cardinals rookie Paul DeJong during the third inning. Fans began cheering the foul-ball catch -- until they realized it was Christie. At an away game against the Phillies in April, a sea of fans mocked him by wearing plastic masks of his face. The Cubs beat the Brewers 4-2 on Sunday.